"A SUPERIOR PIECE OF PULP"
Lee Egan (Timothy Hutton) is a small-time L.A. criminal who is determined to get out of the city and start a new life. He masterminds an elaborate jewellery robbery in Palm Springs - his one last heist., asking his brother (Harvey Keitel) to help him. Roy, a smart thief who successfully created a life of anonymity in the Midwest, succumbs to his brother's plea to assist. For their 'Wheelman', Lee brings in the very unpredictable Skip (Stephen Dorff) - smart, sleep-deprived, impatient and erratic-a potential liability who Roy instantly takes a dislike to. When his brother is murdered, Roy moves savagely into the fray to take revenge on the man who betrayed him and avenge his death. 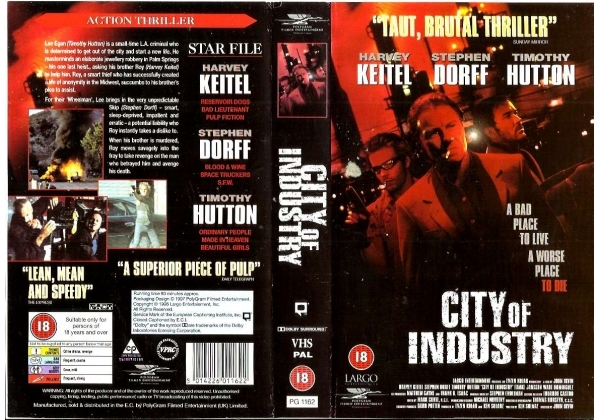 Or find "City of Industry" on VHS and DVD / BluRay at Amazon.